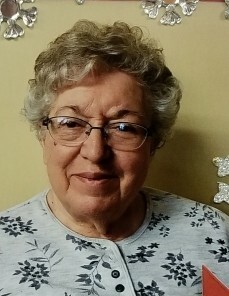 Obituary for Helen H. Gondean | Joseph W. Nickels Funeral Home, Inc.
Helen H. Gondean, 83, of Herminie, passed away Monday, Feb. 4, 2019, in Excela Health Westmoreland Hospital, Greensburg. She was born Jan. 13, 1936, in Rillton, daughter of the late Harry and Matilda (Arnold) Gondean. In addition to her parents, she was preceded in death by her sister and brother-in-law, Elsie (Martin) Garcar, and her great-niece, Laurie Burns. Prior to her retirement, Helen was an executive secretary, having worked for West Penn Power Co., in Greensburg. Helen was a member of the Herminie United Methodist Church. She enjoyed sewing, but most of all she loved going out to lunch with her friends and co-workers. She was definitely a social butterfly and will be dearly missed by her family and friends. Helen is survived by her three nieces, Linda (Tom) Burns, of Herminie, Cheryl (Paul) Johnson, of Florida, and Carol (Ray) Bytzura, of West Mifflin; two great-nephews, Marc Burns and Ryan Bytzura; a great-niece, Amanda Bytzura; a great-great-niece, Rebecca; and great-great-nephew, Eric. The family would like to thank Golden Heights Personal Care Home in Irwin for their continued love and care for Helen over the past two years. Friends will be received from 10 to 11 a.m. Thursday at the JOSEPH W. NICKELS FUNERAL HOME INC., Herminie, 724-446-7251, at which time a funeral service will be held in the funeral home with Pastor Randy Landman officiating. Interment will follow in Westmoreland County Memorial Park, Hempfield Township. In lieu of flowers, the family requests donations made to Herminie United Methodist Church, 3365 Pike St., Herminie, PA 15637. To send online condolences, please visit www.nickelsfuneralhomeinc.com.